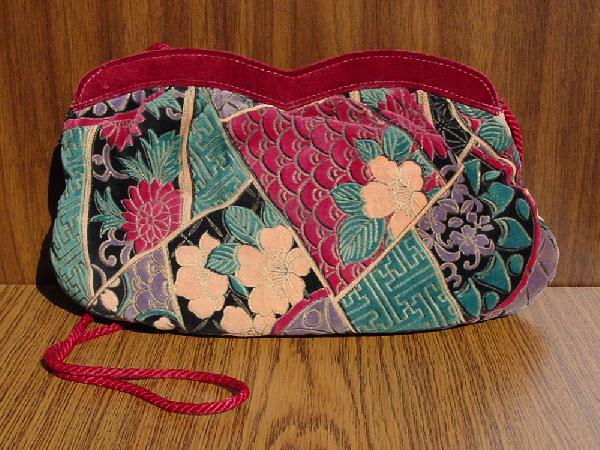 This vintage velvetine purse has a 39" cord shoulder strap that can be tucked in so you can carry it as a clutch. It's in a floral pattern in a deep burgundy, black, peach-melon, gray, emerald green, and light lime green. There are 2 worn spots on one side of the purse, on both rim sides. It has side hinges, and the opening rims pull apart to reveal a nice thick black fabric lining. It was used in a magazine photo shoot with a Kenzo two-piece wool outfit and the suede Bruno Magli slingbacks.